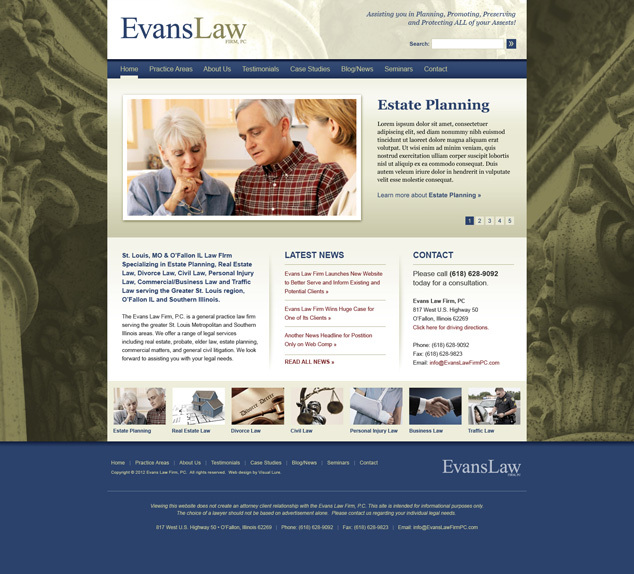 Visual Lure was recently contracted to design a new WordPress website for Evans Law Firm, an O’Fallon IL based law firm that specializes in elder law and estate planning for St. Louis, St. Louis Metro East and Southern Illinois residents. They offer a range of legal services including real estate, probate, elder law, estate planning, commercial matters and general civil litigation. The new website will be built in WordPress and feature a custom home page slider, a seamless news/blog page with a feed into the home page, and a fully custom designed theme. We will also be providing search engine optimization (SEO) services. Below is our initial proposed home page design. Check back soon for the official launch.